Hear the big news? McDonald's put "real fruit" smoothies on their McCafé menu. As a sucker for all things smoothie, I felt compelled to try one. 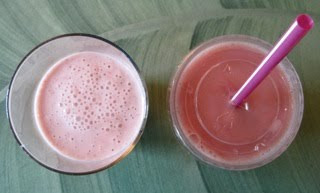 And I had a coupon worth a $1.00 off the ticket price, so I turned yesterday's lunch into a taste test by comparing a small McCafé Strawberry Banana Smoothie to a similar version I concocted in my own kitchen. Needless to say, I prefer the latter. According to the document I downloaded from the McDonald's website, a small McCafé Strawberry Banana Smoothie contains a strawberry/banana fruit blend, low fat yogurt and ice. Sounds simple, but it doesn't stop there. The strawberry/banana fruit blend contains fruit puree, water, sugar, and less than 1% of concentrated apple juice, cellulose powder, natural and artificial flavors, xanthan gum, citric acid, fruit and vegetable juice (for color), pectin and ascorbic acid...still with me?...and the low fat yogurt contains reduced fat milk, sugar, whey protein concentrate, fructose, corn starch, kosher gelatin and active yogurt cultures. If you're like me, you don't know what half of those ingredients are. I kept it much simpler in my homemade version. One banana, four strawberries of various size and shape, a dash of skim milk and a small container of Chobani Vanilla Non-Fat Greek Yogurt (made of skim milk, cane juice, vanilla extract and active yogurt cultures). The biggest offender? Cane juice, which is a natural sweetener, so I wasn't too concerned. Almost immediately, I could pick a favorite. The McDonald's version was incredibly sweet in a completely unrealistic way. Don't get me wrong, it tasted good. But my homemade version tasted real. And it was thicker, which I tend to like. I couldn't, however, taste the yogurt in the McDonald's version—it was fairly overpowered by the taste of banana. It was much more prominent in my homemade version, and even left a slight aftertaste as real yogurt tends to do. And while I could see bits of strawberry in both, I was a little unnerved by the unnatural pinkness of the McDonald's version. Perhaps I just didn't use enough strawberries in mine. But as I finished it off, I couldn't help but wonder—do the nutrition facts compare? Yes, mine has five more calories—but the sugar difference makes up for it. McDonald's puts almost twice as much in their smoothie. And while the 22 grams of sugar in my smoothie may still seem high, remember that it's a completely natural form of sugar. Also note the protein. The more of it you get in a meal, the fuller you'll feel. And if you, like me, are a post-workout smoothie nut then you'll want that protein count to be higher. To conclude, the McCafé Strawberry Banana Smoothie isn't a Daily Dose recommendation. However, if you're prone to indulging in the occasional Strawberry Shake found beneath the golden arches—consider the smoothie a better alternative on all counts. You'll get your icy cold kick, but save a significant amount of calories and fat. Now, what's your opinion? 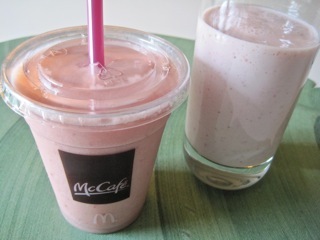 Have you tried a McCafé Smoothie yet?